This guide explains the process for the Voluntary Individual Vehicle Approval scheme. The voluntary IVA rules and regulations differ to those in the Statutory IVA scheme. VOLUNTARY IVA: Statutory IVA is for vehicles that are not yet registered in the United Kingdom. Whereas, the Voluntary IVA scheme is for those already registered in the UK. VIVA will produce a Certificate of Compliance (CoC) for these vehicles when required. Converting a vehicle so that it can carry passengers while seated in their wheelchairs. Modifying a taxi since its original registration with the licensing authority. You need to determine whether your vehicle is a category M1 or N1 to complete the Voluntary IVA form (VIVA 1). The two options are basic level and normal level. Taxi companies should contact their local taxi licensing authority to check which level to apply for. Category M: Motor vehicles with at least four wheels designed and constructed for the carriage of passengers. Category N: Motor vehicles with at least four wheels designed and constructed for the carriage of goods. Note: The Voluntary Individual Vehicle Approval scheme is for use with M1 and N1 category vehicles only. VIVA is for vehicles that already have registration in the United Kingdom. Your consumer protection rights are different to those with SIVA. Value Added Tax is payable on the fee. Inspection of a vehicle by the Driver and Vehicle Standards Agency is not free. There will be some mandatory charges. 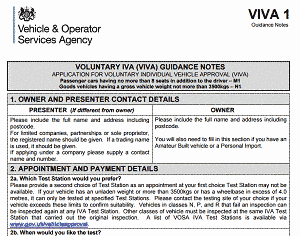 Print and fill in the Voluntary IVA application form (VIVA 1) for light goods vehicles and passenger cars. Post the completed form to the address at the bottom of the document. Note: Use Statutory IVA forms for goods vehicles, trailers, and larger passenger vehicles like buses and coaches. After you choose the DVSA test station they will test your vehicle. They issue a Confirmation of Compliance notification when it passes. The CoC is a notification but not an actual approval certificate. Further information on Vehicle Type Approval is available in the DVSA publications. Check through the Driver and Vehicle Standards Agency guides for the IVA and VIVA schemes. M1 form for passenger vehicles. M2 and M3 form for coaches and buses. N1 form for light goods vehicles up to 3,500kgs (LVG). N2 and N3 form for heavy goods vehicles over 3,500kgs (HGV). O1, O2, O3 and O4 form for all types of trailers. All vehicles carrying passengers must follow seat belt anchorage compliance. Note: Check out the seat belt compliance form (IVA 19a and 19b / VOSA 873 and 874). You also need to complete an amateur built declaration for amateur built vehicles (e.g. a kit car). Use the form (IVA 4 / VOS 768) along with the other required documentation.